Conservative Bergamot T run out in beginning of April.I arranged these center-posts back in January in this post (link). 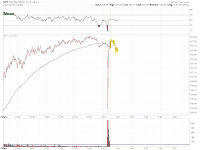 Conservative T is anchored into violent V-shaped November bottom, and proved correct. Now the remaining questions are: will this be a double top with higher or lower low, or some kind of "Null Echo" effect, or may be longer T into summer is not correct at-all. There where questions about validity of December center-post, because Nov 15 and Dec 28 bottoms are too far apart. That aside, I consider this Bergamot T project a success. It guided me just fine since beginning of the year and I am looking forward to doing this again sometimes in future. Here are size and cost basis (incl commissions). 57% invested. Silver and PM miners group is 12%+ allocation, and losing 2.5% of account. FB - 26.20 Chopping in a box. Support 24.70-25.70. Volume Profile (VP) improving in April. FSCHX- 96.05 Half pos basis (25% mark-up) $CEX stop under 368. CEX PFT 370met. More PFT 450; 508-512. NEW YORK--Goldman Sachs on Tuesday closed its recommendation to "short" gold, telling clients to exit bets on lower gold prices. The bank had told its clients to bet on lower gold prices April 10. "Our bias is to expect further declines in gold prices on the combination of continued ETF outflows as conviction in holding gold continues to wane as well as our economists' forecast for a reacceleration in U.S. growth later this year," they said. AP Twitter account got hacked and planted a story that two bombs detonated at the white house, injuring Obama. 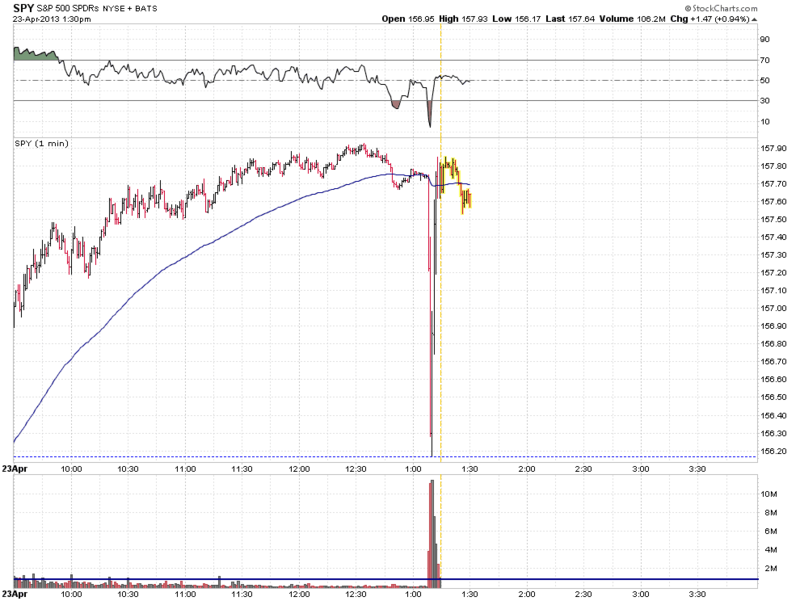 Lasted 5 minutes - 300,000cars ES and 50mil shares SPY.